09.09.2011. "The power of the past and the present is the start-ing point for our bold vision of the future." That's how Friedhelm Loh, proprietor and CEO of Rittal reflected on the company's status after 50 years of success. "We plan to have an annual turnover of € 3 billion by 2015. This goes hand in hand with rapidly growing staffing needs, representing career opportunities all over the world", continued Mr. Loh at the "50 Years Rittal. Power and Vision" anniversary press conference. "We want to reach these goals as a financially independent family business", Mr. Loh added. "In the future, our "Rittal – The System." platform will also leave its mark on the international standard of enclosure technology, climate control and the world of IT." Thanks to the continuous improvement of products and services, as well as the creation of new products, Rittal would continue to develop its ability to innovate, added Rittal's company leader. 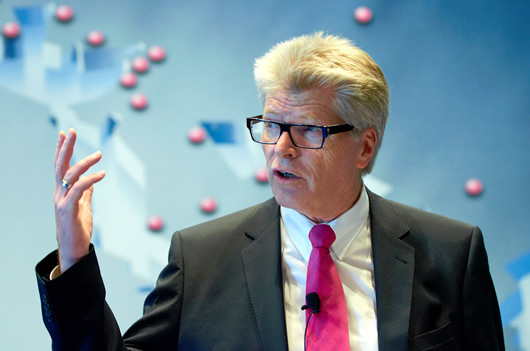 To achieve our ambitious growth targets, Rittal will also have to continue to grow – above all internationally. One focus will be on rising markets such as Brazil, Russia, China and India. There could be "no growth without investment", stressed Mr. Loh, promising that production in Shanghai would be expanded considerably in the near future. He is to provide € 40 million for this purpose. The subsidiary in India is also growing. The finished goods warehouse there is to be expanded by a further 3,600 m². Investment is also planned at the Ritter-shausen site: Production there will be streamlined and made more flexible to make shorter lead times possible. The basis for these investment decisions is, among other things, the positive business performance over recent months. Thus, Rittal's sales are higher than planned after the first six months of 2011. Domestic sales climbed by more than 25 percent over the same period last year and exports were up by almost 27 percent. Thanks to the well-filled order books, the factories are very busy, and Rittal will exceed 2008 levels in 2011. The increased staffing needs are being continuously met: Since the beginning of the year, 800 additional staff have already started work. "We have been already able to land quite a number of great orders this year", Mr. Loh enthused. These include, for example, the Korean Stock Exchange with Rittal's largest ever sale of uninterruptable power supplies (UPSs) and the energy supplier utility Orion, which has installed a large outdoor container data centre in Christchurch, New Zealand. But besides all this, the company has not forgotten its social responsibility. For example, the proprietor and employees have donated more than € 2.5m to social and cultural institutions over the last ten years alone. Earlier this year, € 160,000 was donated to the victims of the disaster in Japan; meanwhile, a fundraising campaign for East Africa is continuing. Rittal is also involved nearer to home: The company recently extended the sponsorship for both the "Rittal Arena" in Wetzlar and for the first division handball team HSG Wetzlar for a further five years. This family business, with currently around 10,000 employees, is one of the fastest growing companies internationally and one of the world's leading system suppliers for enclosures, power distribution, climate control, IT infrastructure, software and services. No less than 1,500 patents worldwide stand testimony to an outstanding culture of innovation. Today, Rittal has 10 production facilities, 63 subsidiaries and 40 agencies all over the world. Image 1: "We plan to have an annual turnover of € 3 billion by 2015. This goes hand in hand with rapidly growing staffing needs, associated with career opportunities all over the world": Friedhelm Loh, Rittal's proprietor and CEO.